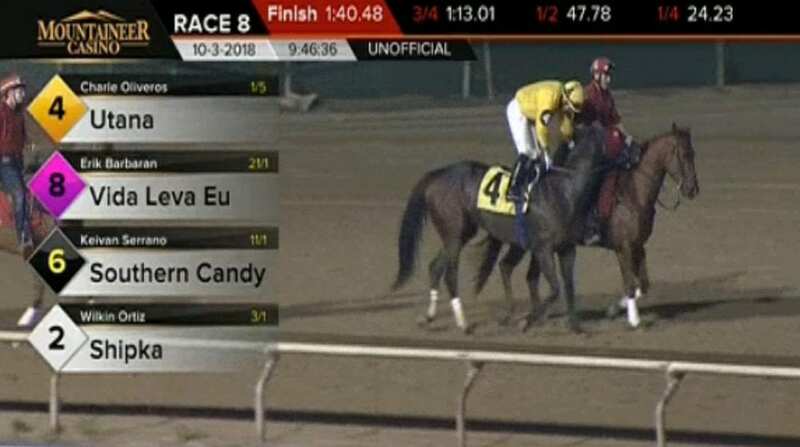 Utana, a 5-year-old Curlin mare whose puzzling off-the-board performance as the heavy favorite in August led to an investigation by the West Virginia Racing Commission, returned to her winning ways earlier this month at Mountaineer Park. Owned by attorneys Clark Brewster and Barry Ostrager and trained by L. Craig Cox, Utana romped to an 11 ¾-length victory on Oct. 3 as the 3-10 favorite in a five-horse allowance contest at a mile for non-winners of two races. The winning performance was in stark contrast to an Aug. 8 Mountaineer Park sprint restricted to West Virginia-breds when Utana wound fifth of seven runners as the 4-5 favorite. The off-the-board finish triggered upside down show payouts of $12.40 to the 5-1 winner, $14.00 to the 6-1 runner-up and $33.60 to the 20-1 third-place finisher as one or more bridge jumpers wagered a reported $26,500 in show bets on Utana. There was a total of $56,068 in win, place and show wagers on the race. Bridge jumpers risk large investments for small returns by focusing on races that often have short fields and a heavy favorite. Many of them wager on races from West Virginia because tracks there have a $2.20 minimum return versus $2.10 in most racing states. With $2.20 minimum payouts, bridge jumpers have to win 10 times in a row to break even for a single loss – if all wagers are the same amount. With a $2.10 minimum, they must win 20 consecutive bets to make up for a loss. According to a stewards report, stewards spoke to jockey Oliveros by phone immediately after the race. Cox also told stewards Oliveros galloped the horse in the same ring-bit used for the race. Utana had won by 8 ¼ lengths on July 24 in her start prior to the fifth-place finish on Aug. 8. Cox told stewards her inside post position and horses to her outside that night prevented her from drifting out. The July 24 win was Utana's first start outside of California, where she'd won once in 12 races for trainers John Shirreffs and Bob Hess Jr. The stewards report, which does not address wagering on the race, absolved Oliveros of any wrongdoing. Subsequent veterinary inspections of Utana found no physical reason for bearing out..
Oliveros rode Utana back to a third-place finish in a Sept. 4 sprint when she was favored at 3-2 odds. He was also aboard for her Oct. 3 victory. There was no show wagering in her most recent winning race where she paid $2.60 to win and $2.20 to place. This entry was posted in NL Article, Ray's Paddock and tagged Barry Ostrager, bridge jumper, Charle Oliveros, Clark Brewster, l. craig cox, mountaineer park, utana, west virginia racing commission by Ray Paulick. Bookmark the permalink.